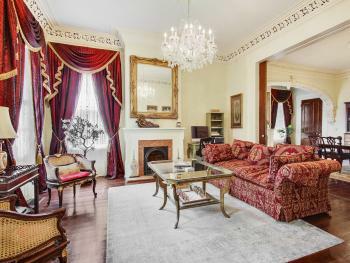 Tall windows open to a large private balcony. The balcony overlooks the front yard with views of the city skyline. 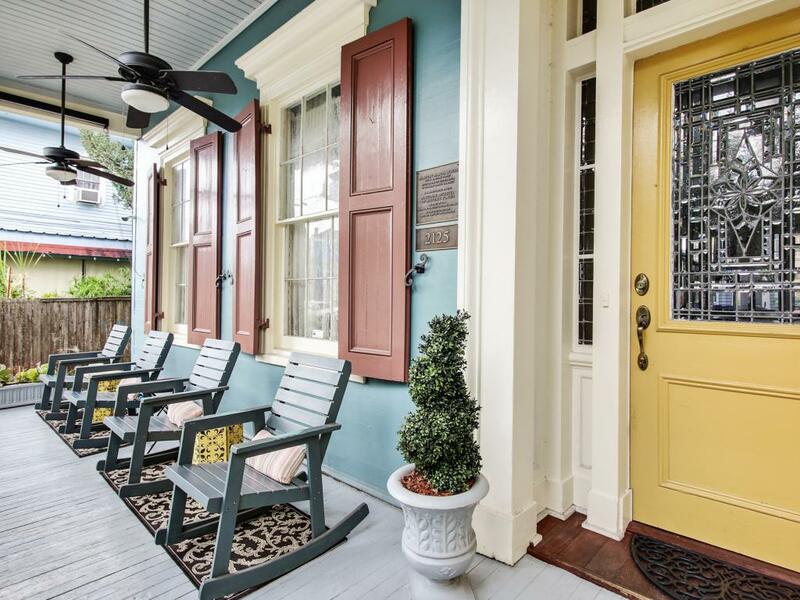 It’s a perfect place to enjoy your morning coffee or an evening glass of wine. 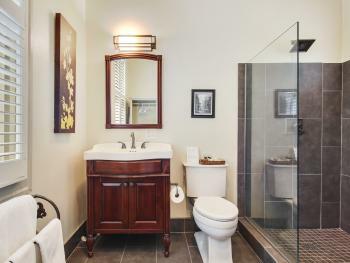 Whichever time of day you choose, sit back, relax and enjoy your time here. 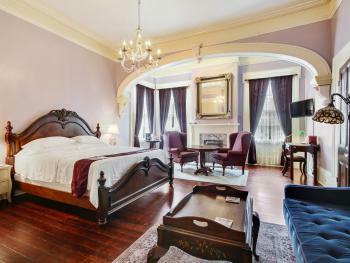 The Bourbon room features a four-poster antique queen bed with designer linens, antique marble top nightstands, a comfortable sitting/eating area on a stylish oriental rug, a writing desk, a decorative fireplace, and a unique “European-style” bathroom with antique claw-foot tub and shower. The luxurious silk drapes can be pulled to darken the room, perfect for late sleeping. This over-sized room is elegant and perfect for any special occasion. 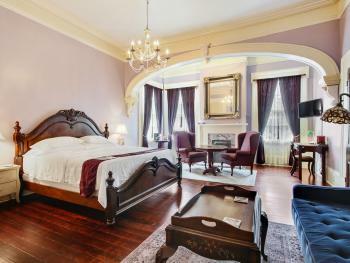 It features a antique style king size bed with designer linens and two sitting areas. New rugs warm the beautiful original heart of pine hardwood floors and a decorative fireplace is located in a separate arched alcove of the room. 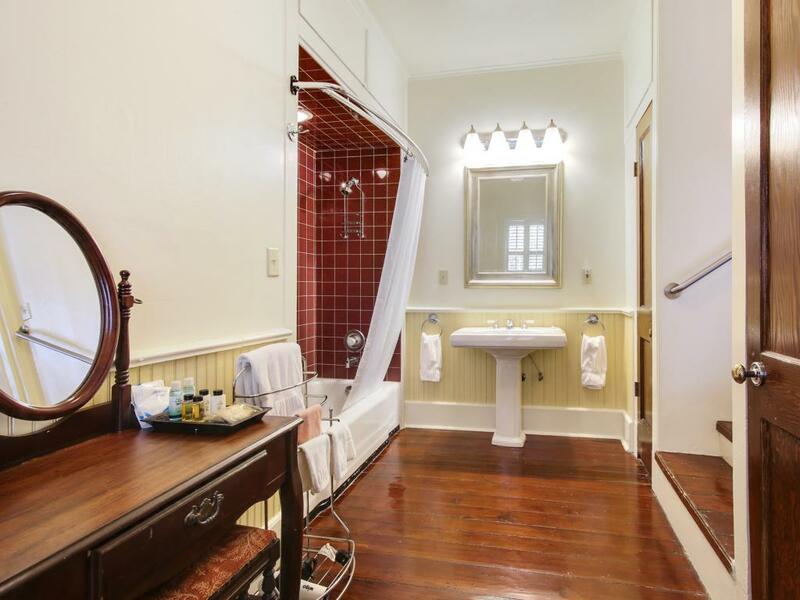 There is a large step-down private bath with tub and shower, complete with make-up table and mirror. 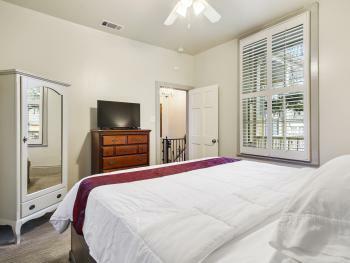 This large guestroom overlooks our courtyard. Plantation shutters veil the windows of this bedroom. 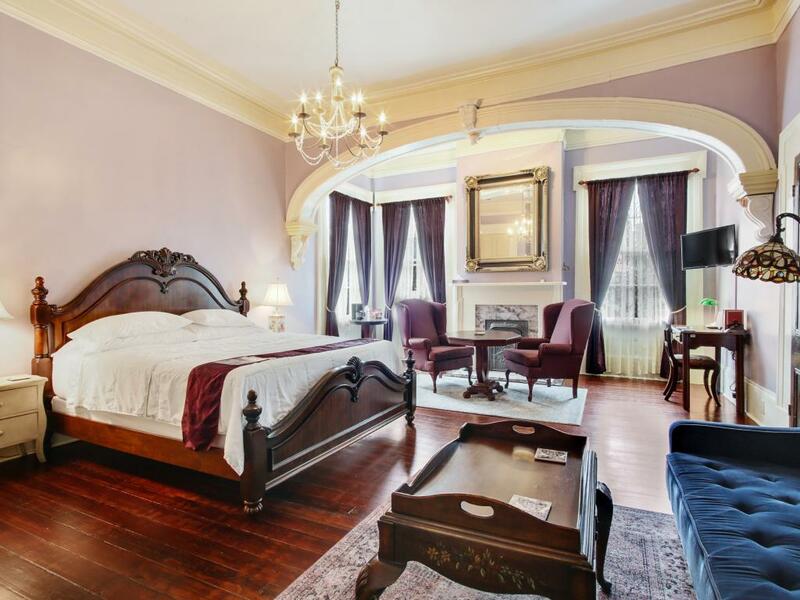 This room offers a king size bed and a sitting area with two wing back chairs. 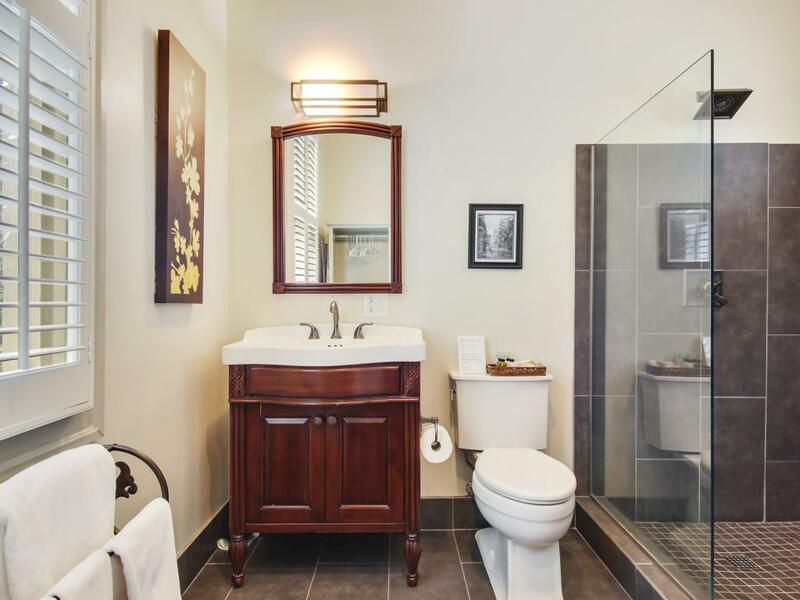 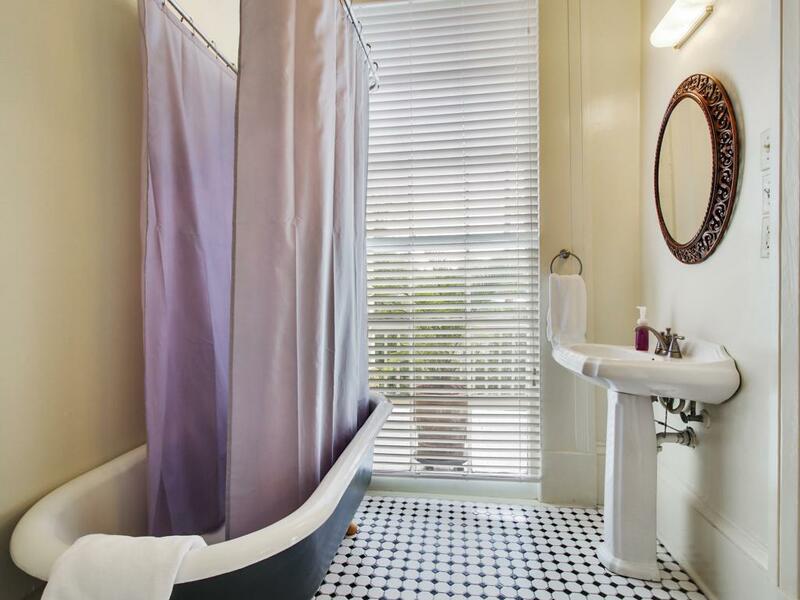 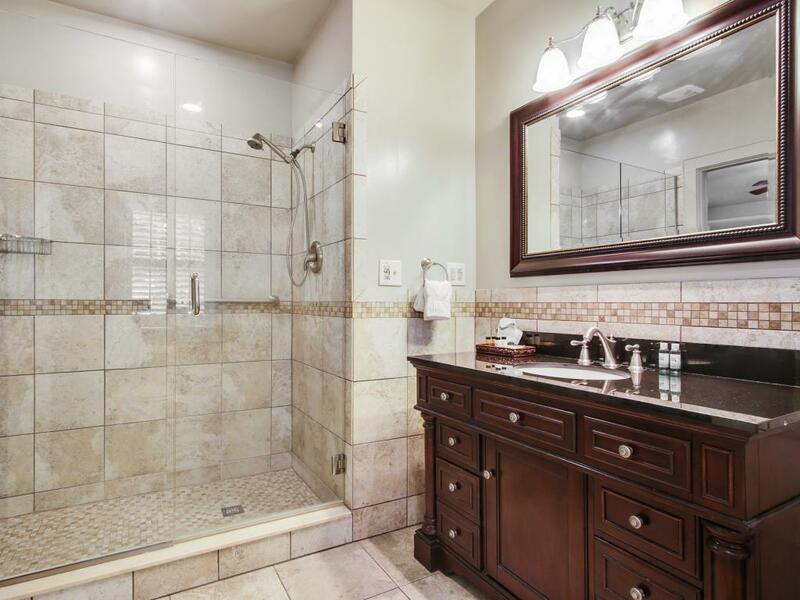 The private bathroom has a beautifully remodeled walk-in shower for two. This room opens to a narrow balcony overlooking our courtyard with a small table and two chairs. 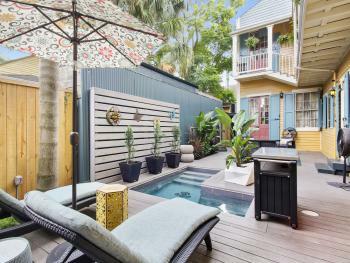 It is the perfect setting for morning coffee or a glass of wine. 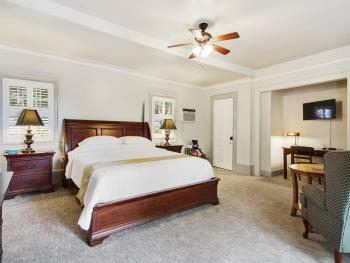 The king size bed is dressed with designer linens. 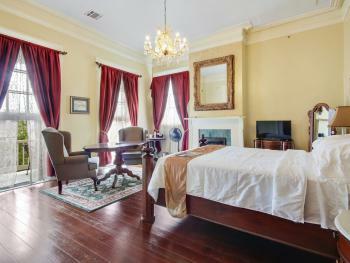 An antique drawer chest and armoire complete the room. 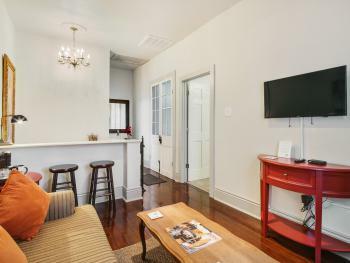 The separate living room area has a sleeper sofa, cable tv, and additional study/bartop area. 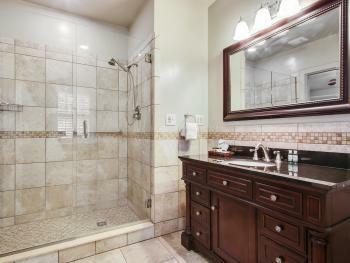 The bathroom offers a walk-in shower, additional armoire. 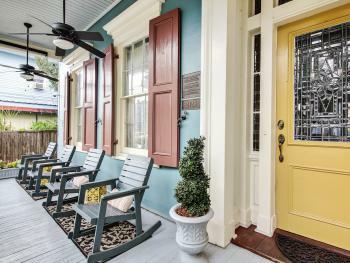 Enjoy Southern Hospitality at its best! 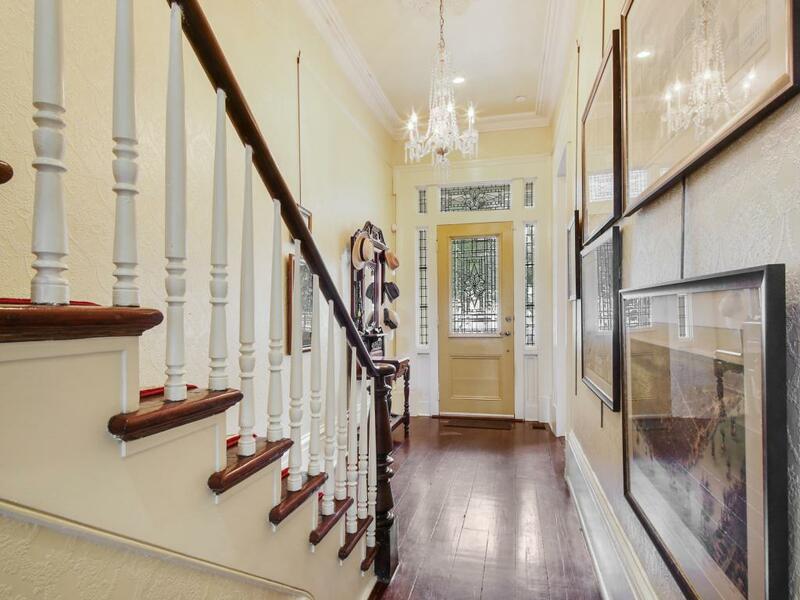 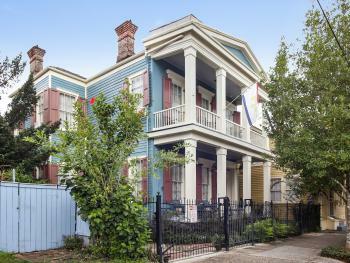 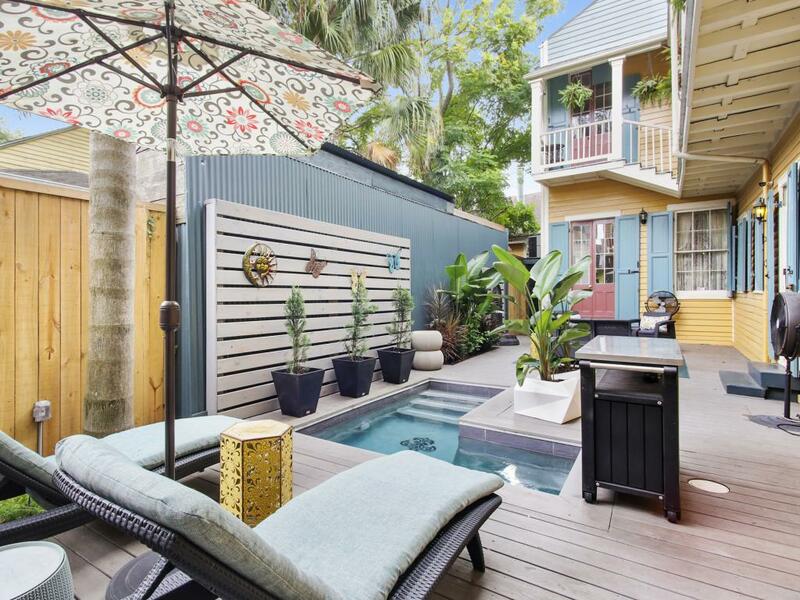 Our beautiful antebellum style property is only blocks from the French Quarter, the French Market and the great restaurants and music venues on the Frenchman Street Jazz strip. Our home is a Grand Greek Revival house built in 1848, and it is part of the National Register of Historic Places. 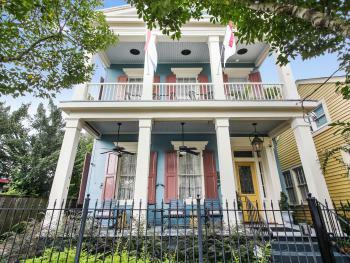 It has been tastefully restored to its original grandeur. Featuring large rooms and bathrooms, our guests consider our home as a perfect base to explore the rich local history of New Orleans. It features pierced plaster molding, 14 ft. ceilings, large windows, crystal chandeliers, period antiques and an interesting art collection. Upon entering through the beautiful beveled leaded glass front door, you get a glance at our extensive collection of New Orleans antique city maps. 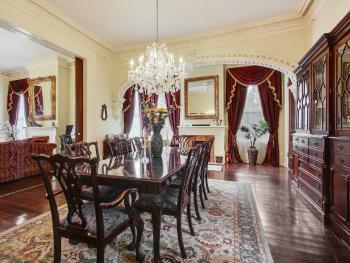 The main parlors have been kept with a significant amount of fine details that have been preserved over the years, from the crystal chandeliers to the original plaster molding and plaster medallions on the ceilings. 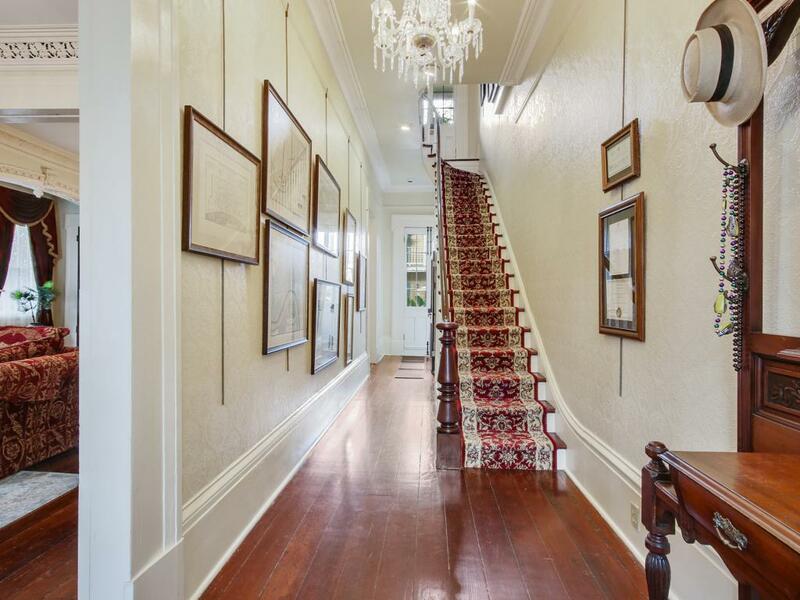 Original Heart of Pine floors have been in place for over 160 years. 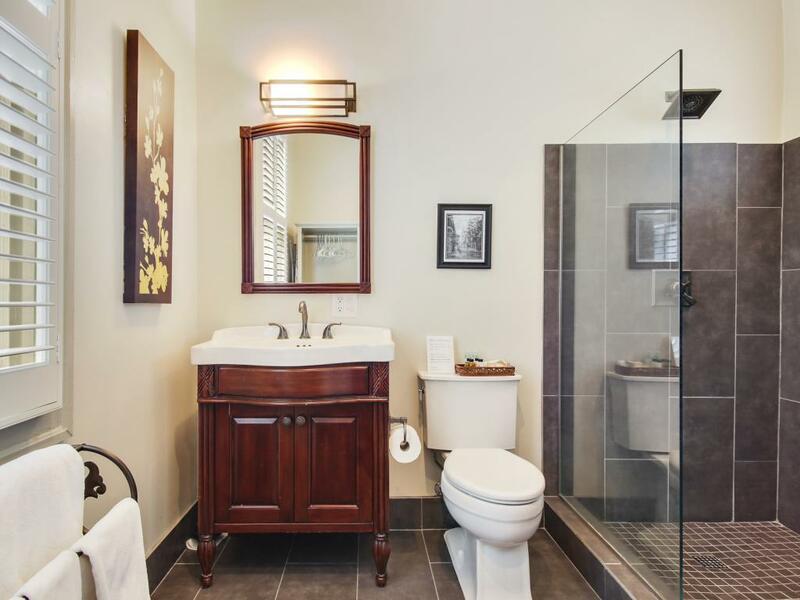 The rooms is beautifully furnished for your relaxation as you unwind. 5. 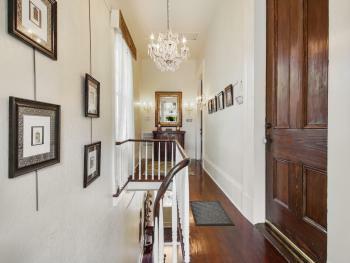 At light at the bottom of the ramp, turn right onto Elysian Fields (You will be heading towards the Mississippi River).